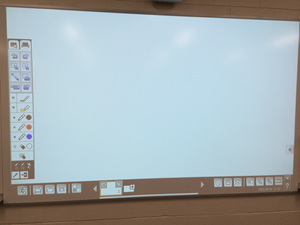 Many of the newly renovated Nicarry classrooms contain Epson Interactive Whiteboards, which are touch-enabled smart boards. Here are instructions on how to use them. 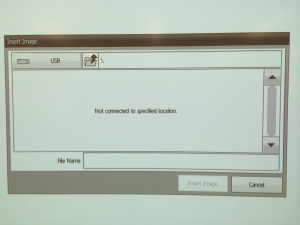 For any questions regarding the Epson boards, contact the ITS Help Desk at helpdesk@etown.edu or x3333. 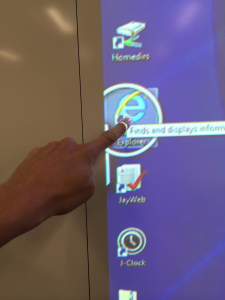 The Epson Interactive Whiteboard is a touch-enabled smart board. 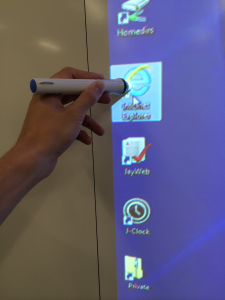 This means that you can interact with what is projected onto the board with the the touch of the Epson pens or your finger. The board uses special ink-free pens. 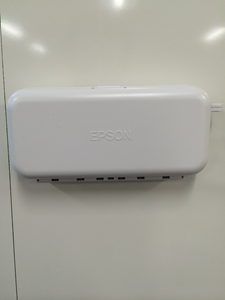 These pens can be found in the plastic Epson case, which is magnetically attached to the side of the board. 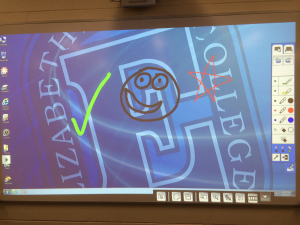 Notice: Please refrain from using any kind of marker on the Interactive Whiteboard. 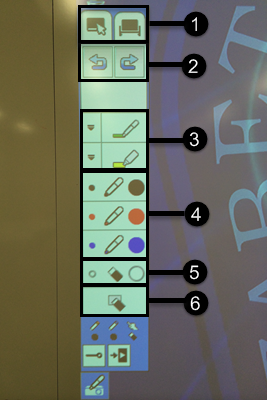 The board features two modes: PC Free Annotation and PC Interactive. To select a mode, tap the board once to reveal the Mode Select button. The Mode Select button should appear on the side of your screen (whether it's the left or right side will vary depending on the room). Tap either button to select a mode. When you tap the board, a button for the Bottom Toolbar will appear as well. It should appear in the bottom right corner of your screen. 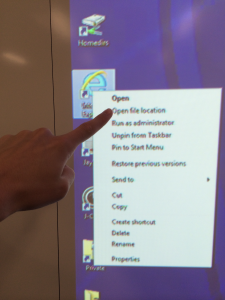 Tap this button to adjust general white board settings. 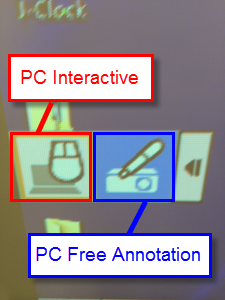 The PC Free Annotation setting allows you to draw and make annotations on the white board with the provided Epson pens or with your finger. 1. Toggle between Desktop Mode and Whiteboard Mode. 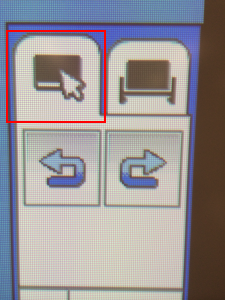 The button on the left is Desktop Mode, while the button on the right is Whiteboard mode. 3. Pen Size and Color. Use these buttons to pick a more specific pen size and color. The top arrow is Pen Selection, the bottom arrow is Highlighter Selection. 4. Default pen colors. Click any of these three buttons to quick change between black, red, and blue pen colors. Each of these pen options are one size. 5. Eraser. 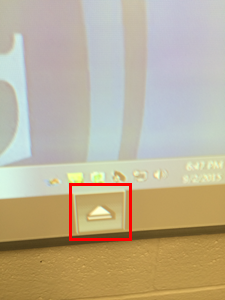 Click this button and then tap and drag on the Epson board to erase any annotations. 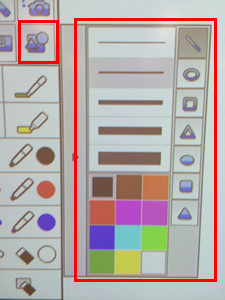 Desktop Mode is the mode where your computer's screen will be projected onto the Epson board, but you can draw and annotate freely on the screen. 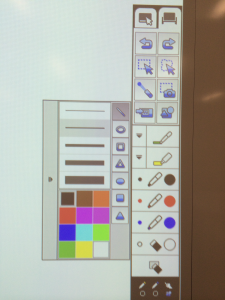 In Desktop Mode, you can draw anything on the board with your finger or the Epson pens, but you cannot click on anything from the board. 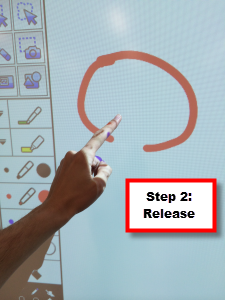 Whiteboard Mode is the mode that allows you to write on a virtual whiteboard. 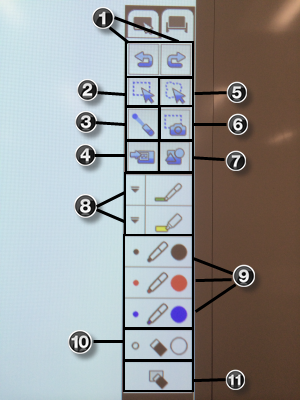 Everything tool that you'll need for the whiteboard can be found on the toolbar located on the side of your screen. 2. Square Selection Tool - Use this tool to select an image by dragging a square around the image. 3. 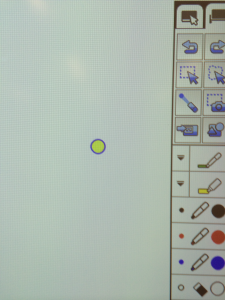 Circle Marker Tool - Use this tool to place a circle marker on the board. 4. Insert Image - Use this tool to insert an image from a file. 5. 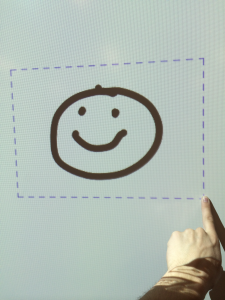 Free Selection Tool - Use this tool to draw freely around an image to select it. 7. Shape Drawing Tool - Use this tool to draw geometric shapes. 8. Pen/Highlighter Options - Use these buttons to customize pen size and color. 9. Default Pen Settings - Default pen colors and size. 10. Eraser - Erase any annotation by clicking on this button and then tapping and dragging with your finger or an Epson Pen. 11. Clear All - Clear all annotations on the board. 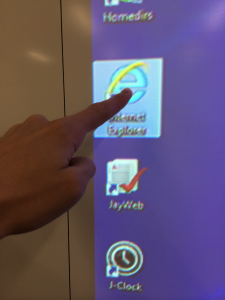 The PC Interactive setting allows you to navigate what's on your computer screen while standing at the Interactive Whiteboard. 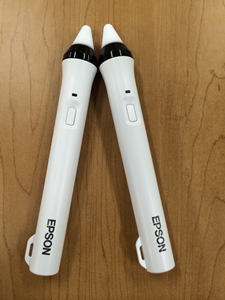 The Epson pens or your finger can be used as a mouse clicker. To right-click with your finger, tap where you wish to right-click and hold until a circle appears. Once the circle appears, remove your finger from the board and the drop-down menu should appear. 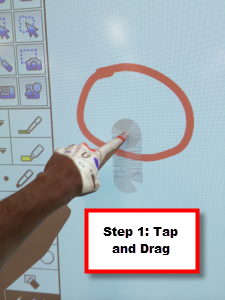 To right-click with the Epson pen, tap the board and hold down the pen. Click the indicated button on the pen to right-click while you're touching the board with the pen. 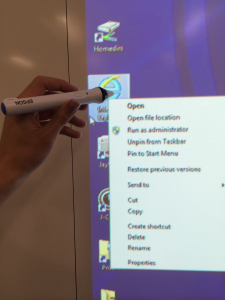 Once the drop-down menu appears, you may remove the pen from the board. Inking in MS OfficeIf you are using Windows 8.x, Windows 7, or Windows Vista, you can add handwritten input to your work and convert it to text. If you have Microsoft Office 2003 or later, you can also use the Ink function to add handwritten notes to a Word document, Excel spreadsheet, or PowerPoint presentation. To open the Touch Keyboard in Windows 8.x, right-click or tap-and-hold on the Taskbar, and select Toolbars > Touch Keyboard. 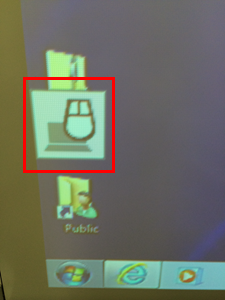 Select the keyboard icon on the screen and select the pen icon. To open the Tablet PC input panel in Windows 7 or Windows Vista, select > All Programs >Accessories > Tablet PC > Tablet PC Input Panel. 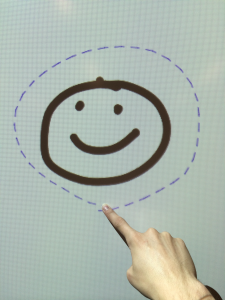 ou can write in the box using the interactive pen or your finger and select from a variety of options to edit and convert the text. To add Ink annotations in Microsoft Office applications, select the Review menu, and select Start Inking. To annotate your PowerPoint slides in Slideshow mode, press the button on the side of the interactive pen or press the projection surface with your finger for about 3 seconds, and select Pointer Options > Pen from the pop-up menu. 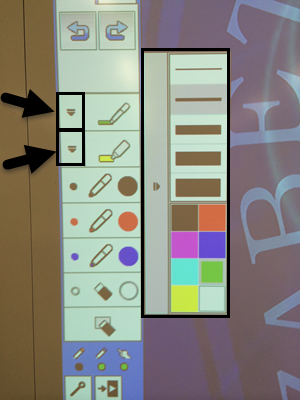 The toolbar located in the bottom right corner of the screen allows you to adjust basic settings of the Interactive Whiteboard. 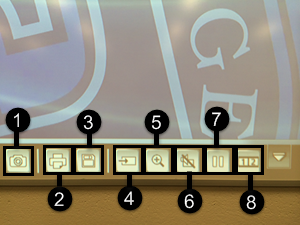 Note: As of September 2015, this bottom toolbar has not been fully synced with the Epson Board, so many of these tools will not work quite yet. 8. 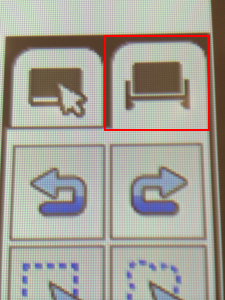 Split ScreenNote: More advanced settings can be configured with the Menu button located on the projector itself. 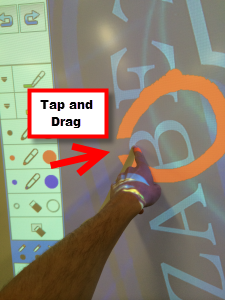 Sometimes the touch calibration on the Epson Interactive Whiteboard can become out of sync. For the most part, the touch calibration will become out of sync around the edges and corners of the board. The middle sections of the board typically are not too much of a problem. If at any point you feel that the touch calibration is too out of sync for you to use the board, please contact the Help Desk at x3333 or helpdesk@etown.edu and we will re-calibrate the board.